want to know what’s important. Here are some helpful tips on calories, fat, carbohydrates, fiber and protein to help you choose healthful foods when navigating the food label! Calories provide your body with energy. Calories come from the carbohydrates, protein and fats in your foods. Bottom Line: Everyone needs calories to be healthy but too many calories are what can cause people to become overweight. Balance the calories you eat with the energy you use for daily activity such as exercise. See What is a Calorie and Making Sense of Portion Sizes to learn more about calories.. There are healthy and not so healthy fats! Healthy fats include mono- and poly- unsaturated fats. Processed foods are high in the unhealthy fats, trans and saturated fats. Processed foods include cakes, cookies, crackers, pastries, pies, muffins, doughnuts, French fries and full fat dairy products. Bottom Line: Choose products that are higher in mono and poly unsaturated fats and that have less (or none) of the trans and saturated fats. Limit processed foods and adding butter to your foods. Choose low-fat dairy products like skim or 1% milk and yogurts. 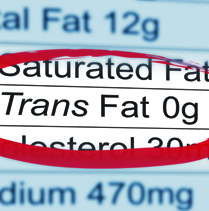 To learn more about fats see Parents: Facing Fat Facts and The Truth About Trans Fat. Carbohydrates are the body and brain’s main source of energy. Fiber protects your heart and body from many diseases, keeps you full for longer, and helps keep your digestive system healthy. Instead of removing carbohydrates from your diet, look for whole grains and high fiber foods. 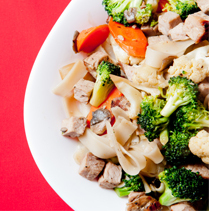 Enjoy fresh fruits and vegetables, whole wheat bread and pasta, low-fat dairy, and brown rice. Bottom Line: Don’t eliminate carbohydrates but do limit added sugar. Look for items high in fiber and whole grains like bread and cereal with more than 3g of fiber per serving. To learn more about fiber, see Where to Find Fiber and How Much Fiber Does My Child Need. Many foods contain some protein but the best sources are lean beef, poultry, fish, eggs, dairy products, nuts, seeds, and legumes such as black beans. Bottom Line: Choose protein foods that are lower in fat like fish, chicken and turkey. The best way to make sure you are eating healthy is to compare 3 food labels of a similar product (e.g. yogurt) before choosing the one that is best for you! For more on choosing healthy foods, see Six Tips that Encourage Your Family to Dine Healthy.